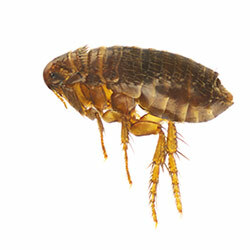 To control fleas on your pet and in the environment it is important to understand the life cycle of the flea. Adults feed on your pet and lay eggs, which fall to the floor, into cracks, onto your furniture, in carpeting, on the grass or in the bedding. In a few days, these eggs hatch into larvae that feed on any debris they can find. This may include dandruff from your pet, dust, mold, hair or flea excrement. They then spin a cocoon around themselves and eventually emerge as full-grown adults ready to feed. Effective flea control includes addressing both your pet’s needs and the surrounding environment. This is especially important in cases of severe flea infestation as your pet’s health can be extremely compromised. Fleas can be among the most troublesome of pests and among the most difficult to completely remove, especially if a pet is present. Allow us to solve your flea problem.